There are numerous training facilities in Kuwait, the initial staging area for many American troops who spend some time there acclimating themselves to the desert environment. The soldiers regularly train to keep in shape and maybe learn some helpful tips. In one exercise, the unit was bussed to an artillery range deep in the desert. The view was rolling sand dunes for 360 degrees. Before practice firings could begin in earnest, a gun misfired. No one was hurt, but it required an expert investigation, which took several hours. Safely certified, they were ready to fire the first shots when a herd of camels appeared on the horizon, necessitating another stand-down. Firing range personnel dispatched a fleet of Humvees to hurry the beasts along. But camels it seems have little fear of puny humans or their machines, and it looked like a lunch break made sense while the round-up proceeded. The soldiers hunkered down opening their MRE (Meals Ready to Eat) pouches, but were interrupted by a group of the dispersed camels who had developed a taste for MREs. 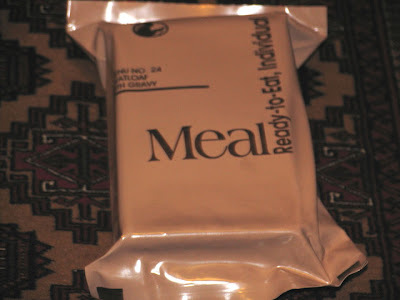 Hopelessly addicted to meatloaf and gravy dinners, they began snatching MREs right out of the soldiers’ hands. Again, camels have little fear of humans, whom they outsize 5 to 1, and whose teeth can cut a NY strip-sized hunk from an arm. The day promised to be quite long– and was. The army does not cancel training.